The Department of Work & Pensions employs a chief psychologist, and his name is David Carew. This is the sort of information routinely dismissed or disparaged by ‘news’ outlets like the Daily Mail all the time. What a waste of money, they say, as if it wasn’t a commitment to understanding and optimising people’s own behaviour, but the equivalent of the therapist’s couch in the corner, serving to the cosseted needs of an over-paid and over-sensitive workforce. 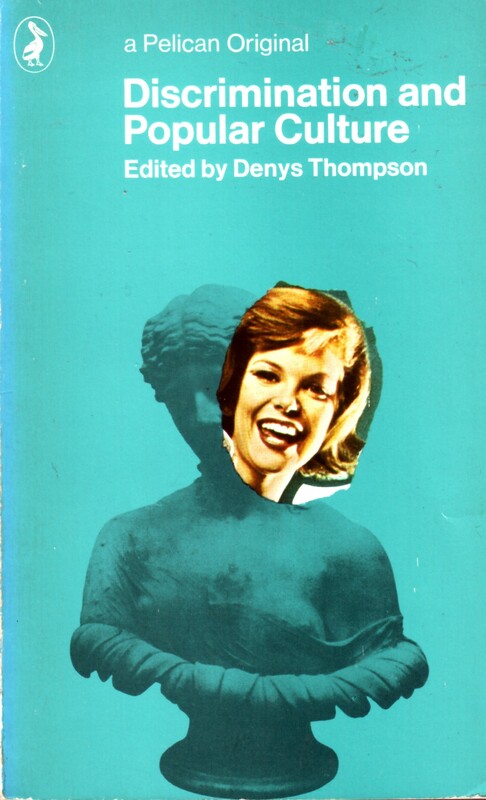 I read a fascinating book of 1960s criticism of popular culture recently. Where so much of what the book covers has changed beyond comprehension, the analysis of mid-market newspapers will be instantly recognisable to anyone familiar with them today: an editorial position finely honed to make the reader feel understood; the intrusive nature of external forces dialled up to create a sense of victimhood; the idea that nowhere else will the reader receive the unvarnished truth that only this newspaper dares to reveal. All tosh, obviously, but it clearly works brilliantly for them. Like Fox News complaining of the ‘liberal bias’ of US media even as it uses the newscorp dollar to violently distort the entire news agenda, it is sophistry of the highest order. The bit I find most dispiriting about this, though, is the way it makes a virtue of closed-minded, cold-blooded certainty. It celebrates the incurious. It undermines the pursuit of novelty as somehow disingenuous, or as possessing an ‘agenda’. As David Carew knows, though, there’s actually an acute and fundamental benefit to understanding new stuff about both yourself and the world – that there’s a genuine element of self-actualisation to new experiences. He talks about the emotional benefits of mastering a new skill, not just the practical ones. He also talks about the notion of self-efficacy, and the capacity of technology to act as either a positive or negative influence on this effect. And I thought of all this when reading about great stuff going on that harnesses this the idea of personal mastery where it’s needed most – in education. First off, and most rhetorically, just how nice is Ministry of Stories? Adapted (for which read ‘stolen with pride’) from Dave Eggers’ shop-front creative writing workshops in the US, Ministry of Stories is where Nick Hornby and chums have set up shop, literally, in Hoxton. The front is dressed up as a retail outlet for monsters – you can purchase fear of varying degrees (eg a case of the collywobbles) by the can. In the back is a writing workshop, where the literary great and good help local children with creative writing and story-telling. It’s fun, uses the skills and talents of experts, reaches out to schools with kids that might not otherwise get the chance to try it, and it just screams try-this-and-see-if-you-like-it in a way that demystifies and democratises one of the most edifying impulses we have. More power to Nick Hornby on this one, then. Elsewhere, social media and web technology are being used to motivate slightly older kids to do the same. 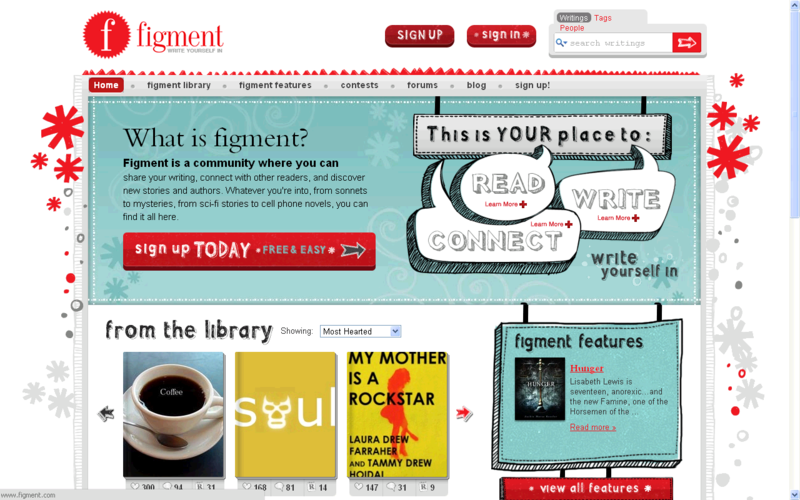 Figment.com, launched this week by former New Yorker Managing Editor Jacob Lewis and New Yorker staff writer Dana Goodyear, provides a home for creative kids, where young authors can not only upload their work, but also read work by their peers. By providing a forum for story-telling, it feels like the site is part of the movement that is starting to understand the real potential of social networks beyond the opportunity to chat, poke and gossip. 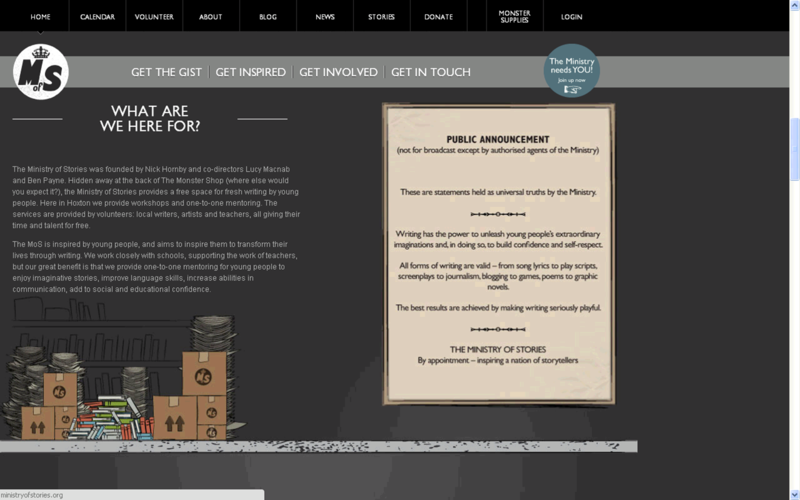 Young writers will now have a conduit the adult publishing community, and vice versa. All of which plants it squarely in the tradition of literary history. There’s always been places to which aspiring artists gravitated. Previously these were cities (Athens, Paris, Berlin, New York), but there’s no reason why these Figment can’t become the first of these cities online – how exciting that it’s just as open to kids with ambition and talent as it is to people with the freedom and money to travel. The place I discovered Figment drew a parallel with The Paris Review as an outlet for young writers, a place to learn the rules of the game, and a place to feel a part of a party—”one ongoing, ever-changing, and urgently necessary to the world of writing and writers”. And a place for the rest of us to discover new talent. It seems like the appetite for the new is yet another thing that isn’t new at all.